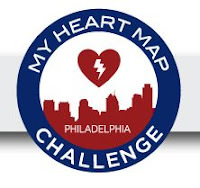 Armed with a free app installed on their mobile phones, contest participants will snap pictures of the lifesaving devices -- which are used to restore cardiac arrest victims' hearts to their normal rhythm – wherever they find them in public places around the city. Participants will use the app to geotag the photos with their location and details about the device like its manufacturer. Then, they'll send them to the research team via the app itself or the project's web site. The data collected will be used to create an updated app linking locations of all public AEDs in the city with a person's GPS coordinates to help them locate the nearest AED during an emergency. The person or team that finds the most AEDs during the month long contest, wins $10,000. To read the news release on this effort, click here. To go to the My Heart Map Challenge website, click here. Comment: There's only one word for this effort: Brilliant!